YOU BETCHA! No need to take our word for it either. We have 100’s of 5 star online ratings from happy visitors from around the world. 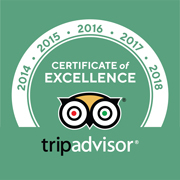 If you have any doubts that you’ve selected the best jeep tour company in Colorado, just take a look at our online reviews on Facebook, Yelp, Google, or Trip Advisor. Does everyone who takes our jeep tours enjoy them? Honestly, no. 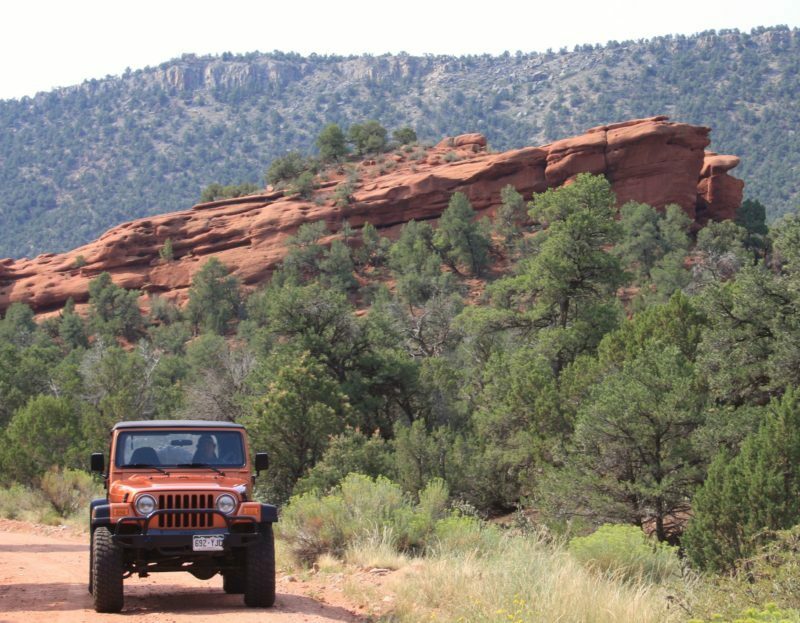 We are an off-road jeep tour company and we explore the great outdoors, and that means we experience evolving terrain, unpredictable weather, rocks washed onto the trails, and a very rare but possible flat tire or mechanical issue while out on tour. Our jeeps work hard each day, but they are very well-maintained, our guides carry 2-way radios and have CPR certifications, and they are trained to handle emergencies, should they arise. The overwhelming majority of our guests have a great time, but our tours may not be right for everyone. Please don’t hesitate to call us before booking so we can discuss your particular needs and desires. It’s your vacation and we want you to have fun. And, we would much rather discourage your business than have you leave unhappy! YES! We operate tours all year long, in all weather conditions… from sunny and hot to snowy and cold. Our custom Jeeps are open-air, with roll bars and roofs, which provide some protection from the elements. This arrangement is great for sightseeing and taking pictures, but be aware that it will be windy, so it’s best to be prepared with jackets, secure hats, ponytail holders, sunglasses, and sunscreen. Several of our vehicles are equipped with roll-down canvas with plastic windows, which provide a more comfortable ride during rain, snow, and cold. They do, however, reduce clear visibility for sightseeing and photography, so we only use them when necessary. If you are uncomfortable with the elements, during any season, while on tour, please speak with your guide and they will do their best to make adjustments to best suit the needs of all guests in the vehicle. Want more info on our weather? See the Local Information section below. When selecting a tour, consider everyone in your group, their ages, attention span, what they want to see, and the length of the tour. We stop occasionally along the routes (especially on longer tours) to let you stretch your legs, admire the views, and take pictures. All of our tours are incredibly scenic and can be done by almost anyone. However, our tours are not necessarily for everyone. Because we are an off-road jeep tour company, and you’re riding in open-air vehicles for 3+ hours, you should expect it to be windy, bumpy, dusty/damp, sunny/cloudy, or hot/cold – depending on the time of day and the season. And, in order to reach the incredible views and vistas we tour, there will also be narrow roads, sheer drop-offs and heights to be navigated. While some folks are uneasy with such things, most guests find them to be an exhilarating part of the jeeping experience. If you have specific questions about the above, please don’t hesitate to ask before making a reservation. Royal Gorge 1/2 Day, our most popular 1/2 day tour, includes more advanced trails and rougher steep climbs. This is the longer of the two half day tours. You’ll climb to the top of Fremont Peak for amazing views and see dinosaur tracks. 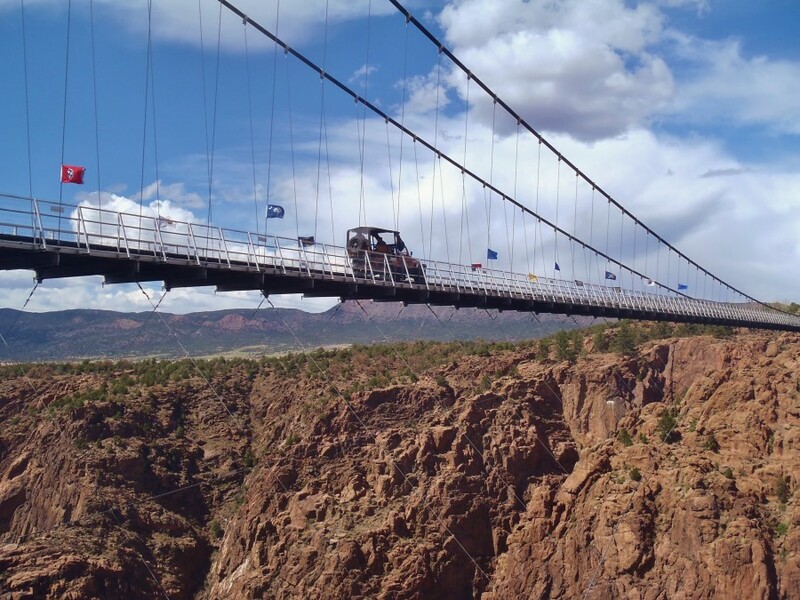 This tour includes vertical views down into the world famous Royal Gorge and drives over the Royal Gorge Bridge! Departs twice daily at 8:30am and 1pm. Tour time is approximately 3.5 hours. **Free bonus – see below. Red Canyon 1/2 Day is a bit steeper, with a rougher road than the Royal Gorge. 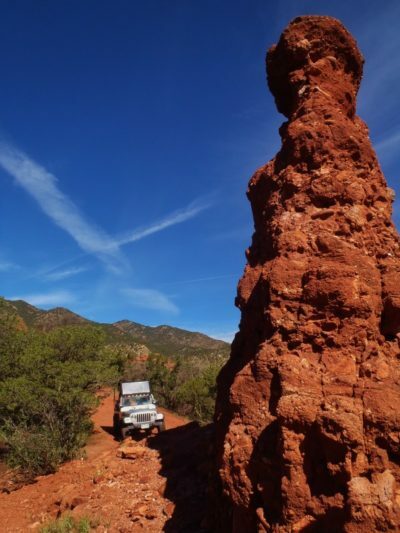 It includes a beautiful drive through the Fountain Formation in Red Canyon Park, and climbs an incline to Overlook Arch. To see the arch, you’ll need to be able to walk a couple hundred feet on a rocky path. You’ll also see Indian petroglyphs and dinosaur tracks. Departs twice daily at 8:30am and 1pm. Tour time is approximately 3 hours. Full Day Royal Gorge is a combination of the Royal Gorge AND Red Canyon tours listed above, with lunch included. You will do a half day loop, return to base camp for lunch, then head back out for the second half of your tour. Departs once daily, year-round, at 8:30am. Tour time is approximately 7- 8 hours including lunch. **Free bonus – see below. Gold Belt, also known as the Fall Foliage Tour, is the least rough of our tours. It visits the historic gold mining towns of Cripple Creek and Victor, is rich in history, amazing high mountain scenery, goes over unique bridges and through old train tunnels, and has plenty of pines and aspens along the way. It has the greatest elevation change, topping out at 10,500 feet. and covers the most miles. Due to the elevation, be prepared with a light jacket, even in summer. This tour includes lunch in Victor, CO. Departs once daily, year-round (weather permitting at 10,000 feet!) at 9am. Tour time is approximately 6 to 7 hours including lunch. Royal Gorge Sunset Dinner, our evening Royal Gorge tour, includes more advanced trails and rougher steep climbs, with a stop for dinner the restaurant overlooking the Royal Gorge Bridge. You’ll climb to the top of Fremont Peak for amazing sunset views, see dinosaur tracks, peer into the gorge from a high cliff, and drive over the Royal Gorge Bridge. Departs once daily during the summer, in the late afternoon, and the rest of the year as a custom tour only. Tour time is approximately 4 hours. **Free bonus – see below. 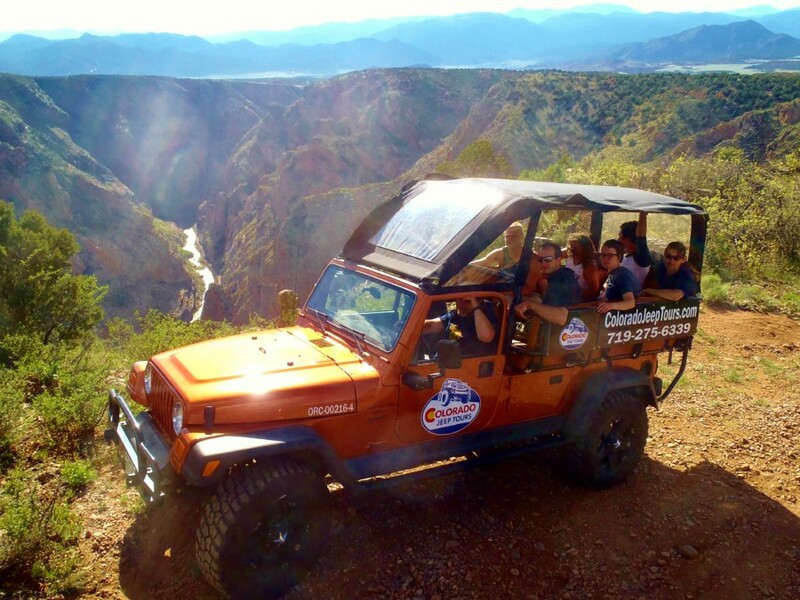 COMBO PACKAGES: Don’t forget to take a look at our full day multi-adventure combo packages, which include a 1/2 day jeep tour plus another 1/2 day activity, such as whitewater rafting, zip lining over the Royal Gorge, the Royal Gorge Route Railroad, or wine tasting. We have something for everyone! 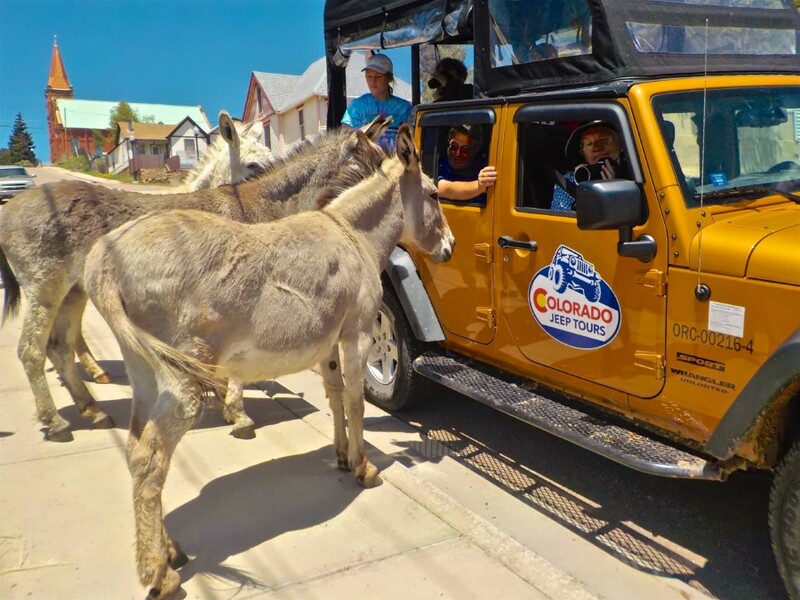 ** FREE BONUS: New for 2019 – All customers who take a jeep tour to the Royal Gorge receive a FREE general admission ticket to the Royal Gorge Bridge & Park, compliments of Colorado Jeep Tours. To receive your free tickets you must purchase a regularly-priced Royal Gorge jeep tour or Royal Gorge jeep package via our website ONLY. This offer is not valid if you book through a booking partner or a 3rd party booking service, such as TripAdvisor. Not valid with any other offer, discount, custom or group booking. Tickets have no cash value, may only be redeemed by the party who took the tour, and must be used within 24 hours of the tour. Contact us with any questions about this bonus. Question about packages? See the Combo Packages section below. What are the best tours for kids? There are a lot of considerations that go into answering this question. How old are your kids? Are they adventurous? Can they handle a 3+ hour off-road tour? Are they old enough to do the combo packages? Here is a general guideline for our jeep-only tours and full day combo packages, broken down by age group. Age 5+: Any ½ or Full Day Jeep tour, the Jeep & Wine (Under age 21 receives juice instead of wine at a discounted rate), and the Jeep & Raft at Bighorn Sheep Canyon. Age 8+: Any ½ or Full Day Jeep tour, the Jeep & Wine (Under age 21 receives juice instead of wine at a discounted rate), and the Jeep & Raft at Bighorn Sheep Canyon. 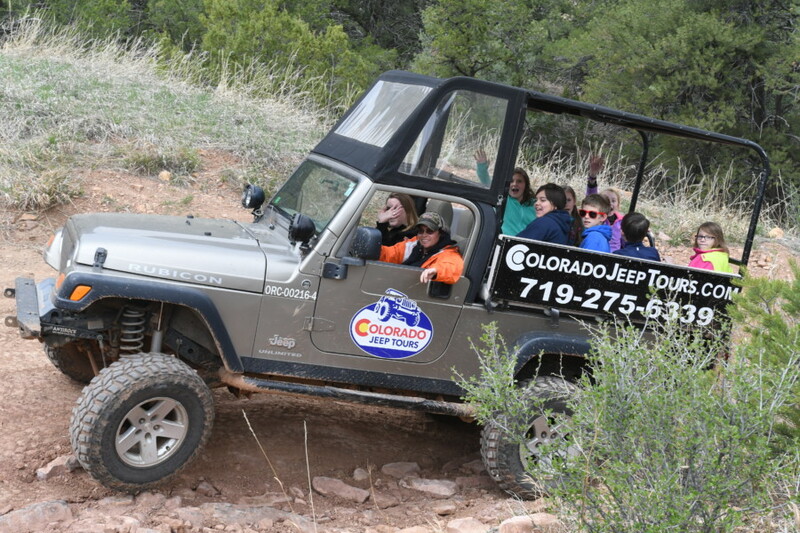 Age 12+: Any ½ or Full Day Jeep tour, the Jeep & Wine (Under age 21 receives juice instead of wine at a discounted rate), the Jeep & Raft at Bighorn Sheep Canyon or Royal Gorge, and the Jeep & Zip Line (Height and weight restrictions also apply.). Keep in mind that most of our tours are very kid friendly (even the little ones in car seats), but no one knows your kids like you do, and there may be restrictions imposed by some of our booking partners on age, weight, and height. Almost anyone of any age can take our tours, but it’s up to your discretion if your family can handle the off-roading experience. *NOTE: If your child requires a car booster seat, you need to bring one. Your child’s seat will be securely attached in the Jeep just as you would in your own vehicle. If you need child/baby equipment, there are two companies in Colorado Springs that provide rentals. Check with Babierge or Traveling Baby. Are tour times / schedules exact? No. Although we try very hard to stick to the tour itineraries as they are outlined on our website, there may be situations that affect tour departure times, length of trip, and end times. These may include but are not limited to, weather and road conditions, staffing availability, mechanical issues that may arise on tour (such as a flat tire), city/county road closures or detours, and/or booking partner changes (train schedule, a concert at the bridge), etc. Your understanding and cooperation during unforeseen tour modifications are sincerely appreciated. And, so that we can keep the tours departing on schedule for all guests, we request that you please arrive on/before your scheduled check-in time. Our Royal Gorge region tours leave from our office in Canon City, located in the Raft Masters office red building, at 2315 E Main Street. We are one block south of Highway 50. If you’re on Highway 50 near McDonald’s, you’ll see the back of our facility south of the train tracks. Unless all vehicles are already out on tour, you should see at least one jeep parked out front. Guest parking is across the street from the check-in office. Look for the bright yellow “Parking” sign. Coming in from the Colorado Springs Airport (COS)? We are an easy drive, usually less than one hour. Here’s a map with directions. No. As all tours start at our office, and there may be several parties on each jeep, we do not have the ability to provide transportation to/from hotels, the airport, or other cities. If you are in Denver, Colorado Springs, and/or you do not have a rental car, see Can I get around without a rental car? in the Local Information section below for information on transportation options getting to, and around in, Canon City and the Royal Gorge region. Coming from the Colorado Springs Airport? Here are directions and a map. I want to be a tour guide! Are you hiring? Yes! We are always in search of awesome, fun and safety-conscious jeep tour driver/guides. If you’d like to apply, please complete the online application and be sure to send us a cover letter along with your resume. (Or, if you prefer, you can also download our guide application PDF to print and mail to us, or drop off at our office.) 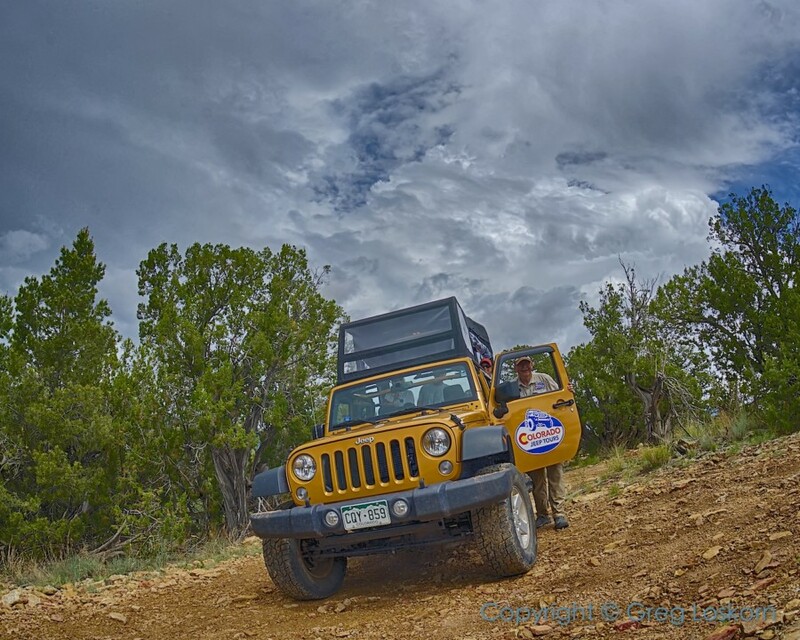 Then, once you have submitted your online application and resume, feel free to follow up with our Fleet Manager (FleetManager@ColoradoJeepTours.com) about the status of your application. Is payment required to book? YES. Because our custom jeeps only hold an average of 8 people each, we have to schedule guides in advance and pay private landowner access fees, payment in full is required to make a reservation. YES. We are happy to try to get you on a tour if you stop by our office. However, it’s important to note a few things. First, that although we are open for tours and phone calls 365 days a year, the desk staff does not necessarily come into the office every day, as they work around pre-booked tour schedules. If you arrive at our office between 8am and 5pm and no one is there, please call reservations at 719-275-6339. We may still be able to accommodate your last minute tour request. Secondly, the same on-demand schedule applies to our tour guides. They are on call every day, all year long, but they aren’t waiting on site. If a tour is not already scheduled, we will need to contact the guide, give them time to arrive, and inspect their jeep for safety before heading out. Therefore, we generally need a minimum of two hours notice before any tour – pre-scheduled or last-minute – can start. Again, give us a call at 719-275-6339, even if it’s last minute. We’ll do our best to accommodate your request. Can I pay in cash when I arrive? SURE! We love cash, but it’s important to note that we do not make reservations, or hold tour seats, until we’ve received payment in full. If you intend to pay in cash upon arrival, there is no guarantee that a tour will be available unless we have a credit card on file, in the case of a no-show. As we accept all major credit cards, we recommend that route to secure your seats. Bookings can be made with any major credit card through our website, or by calling 719-275-6339. If you are a party of 10 or more, accommodations may be made for large groups booking in advance. Contact us for details. Cancellations for parties of 9 or less, made more than 14 days prior to the tour, receive a refund of the amount paid less a $20 Cancellation Fee PER PERSON. No refunds are given within 14 days of a tour. Cancellations for parties of 10+ and custom tours made more than 30 days prior to the tour, receive a refund of the amount paid less a $20 cancellation fee PER PERSON. No refunds are given within 30 days of a tour. What if I'm late or can't make my tour? Check-in is 30 minutes prior to the tour. Because we leave at pre-determined times, need time to check-in other guests, have to verify waivers are signed before boarding and prepare for all tours going out each day, it is imperative we keep to our departure schedule. If you fail to arrive at our office by the specified check-in time, your reservation will be canceled and your seats will be released without refund. We understand that you are on vacation where time is a somewhat fluid concept, but there are no refunds, or re-scheduling options if you’re late or don’t show up for your tour, so please plan accordingly. No. 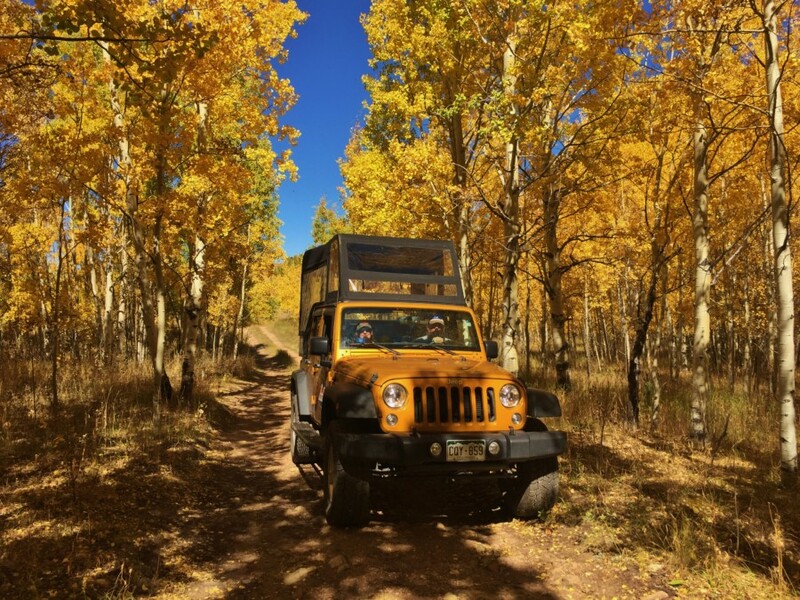 Although we operate our jeep tours year-round, we are primarily a seasonal business, like many in Colorado’s tourism industry. Therefore, our guides work on-demand, with no guarantees of steady employment. They are paid a nominal amount when a tour is booked but, like others in customer service positions (such as hairdressers or restaurant servers), they rely on gratuities as part of their income. If you are happy with the service your guide provides, please consider offering them a tip at the end of your tour. Need a guideline as to the amount? Most customers tip 10% – 20% of the before-tax tour price. However, gratuities are not expected, nor will you pressured to offer one, but they are always appreciated. And, by the way, if there was a problem with your guide, and you didn’t feel they deserved a tip, please send us an email with your feedback. It helps us to know about issues so we can continue to improve our customer service. Colorado’s weather is ever-changing and it changes quickly! Light to medium jackets (and/or rain slickers) may be needed in the summer and heavier jackets and stocking hats are recommended for the rest of the year. Sun protection, sunglasses, and a bottle of water per person are suggested, as well as any medication that you might need. Tennis shoes or boots are recommended, as we get out of the jeeps in rocky locations. Try to stay away from flip-flops or sandals. If you have long hair you may want to bring a hair tie. And of course, don’t forget your camera. If you arrive at our office and forgot to bring something, we have a retail store with most things you might need. Yes, you may bring along your purse or day backpack, as long as it fits in your lap or under your feet, but luggage, large bags, sports gear, etc., cannot be accommodated. Call 719-275-6339, email us, or consult with your guide before the tour if you have questions about the above guidelines and recommendations. Are you doing a Jeep & Raft combo tour? We recommend that you review the “Where do I change” in the Combo Packages section below for general info pertaining to rafting, or the What Should We Bring/Wear FAQ in the Out On Tour section of the Raft Masters website prior to your tour. We go rain or shine! Some of the most memorable trips and views have been experienced on our tours because of wet or inclement weather. On occasion roads and trails can be closed during wet times of the year to protect that area. Tours may be altered due to road and trail conditions. Please keep in mind that there are no refunds given if you cancel within 14 days of your tour, or no-show on your tour day. However, in the unlikely event that we cancel your tour for extreme weather, mechanical issues, or any other reason, a 100% refund will be issued. MAYBE! Most dogs are welcome in our jeeps, but there are restrictions pertaining to behavior, temperament, size, health, number of people in the jeep, etc. Also, advance reservations are required to bring your dog so we have time to make accommodations. Is there a fee to bring my dog? POSSIBLY. See the online Dog Waiver form for information and details on our dog policies. Please call 719-275-6339 to make a reservation that includes a dog. Also, it’s important to note that due to the nature of the activities, dogs are NOT permitted with some of our booking partners on combo tour packages, or their may be restrictions. For example, it wouldn’t be safe (or practical) to take a dog on a raft. If you need a referral to a dog daycare or kennel, see the pet boarding FAQ in the Local Information section below. Holy Cross Abbey (wine tasting) – Permitted on the grounds and patio. Not allowed in buildings. Raft Masters (whitewater rafting) – NOT permitted on any tour. Royal Gorge Railroad – Pets NOT permitted. Service animals OK. See guest services. ** Note regarding Royal Gorge Bridge: Guests can leave their dog in a kennel at the bridge at no charge while they are in the park. They must bring their own water bowl. Kennel keys can be picked up at admissions. Contact the Royal Gorge Bridge at (888) 333-5597 with dog kennel questions. No. If your child needs one, you’ll need to bring it along with you. Your child’s seat will be securely attached in the jeep just as you would in your own vehicle. If you need child/baby equipment, there are two companies in Colorado Springs that provide rentals. Check with Babierge or Traveling Baby. YES! We make every effort to accommodate everyone, however, it’s important to understand that due to the nature of the tours/jeeps, there are limitations. And, as you know your situation better than we do, it’s important that you make the final determination if we can safely take you on a tour. If you have mobility issues (crutches, walker or wheelchair) we will do our best to help you in/out of the vehicle, assuming our staff can do so without risk of injury to the guest or themselves. This is wholly at the discretion of each tour guide. Please note that there is little room to store or transport larger mobility devices like wheelchairs or crutches. Devices that fold down are helpful but we suggest that you contact us about your unique situation when you make your reservations so we can plan for your arrival. Three-point seat belts are available in front passenger seats, but only lap belts are available in the rest of the vehicle. If you are of larger size than a standard seatbelt, we have a limited number of seat belt extenders to make you more comfortable. Seat belts must be worn at all times while in our jeeps. If you have special seating needs, it’s imperative that you contact us in advance to give us an opportunity to make necessary arrangements. DOME CAR: There are 7 steps onto the train and 7 steps into the VIP Dome car. The train’s staff cannot do a lift into the Dome so the customer must be able to do all 14 stairs to ride in the Dome. The stairs are steep at the maximum of 9 inches in depth. There are railings onto the train as well as into the Dome car. COACH CAR: In Coach, the train can do a lift for any guest who cannot do the stairs. If the guest has a wheelchair they have designated seating for your comfort. Please be sure to mention a wheelchair (if you use one) or whether you’ll need to use one from the train. Please note that wheelchairs need to be a maximum of 24 inches from the outside rim to the outside rim of the wheels. If your wheelchair does not meet those guidelines the train has a wheelchair available for you to switch into. The train only has one coach car and one club car available for wheelchairs due to the open air car being adjacent to them. In other cars, guests have to travel through another car to get to the open-air car. If you need more information on the Royal Gorge Railroad accessibility, please visit their website or call 888-724-5748. The Bridge & Park is handicap accessible, but please be careful on the steep trails you may find throughout the Park on either side of the gorge. The Southern side of the park has a 200-foot elevation difference from the bridge to the highest point at the South Side Gondolas. Due to this difference, the red gondolas are accessible via the Visitor Center on the North Side upon entrance into the park. The gondolas are free with general admission and you may ride them as many times as you like. Jump on board for a round trip ride to experience the breathtaking views & scenery. A wheelchair accessible golf cart is available on a first come, first serve basis at no charge to Bridge & Park guests. Please inquire at the Information Desk (in the Bridge’s Visitor Center) for availability & details. Can I go if I'm pregnant or have medical issues? Probably! But, that’s entirely up to you and your doctor, and obviously depends on if you are at risk or close to term. Our jeep tours are predominantly off-road, on bumpy dirt/rock trails, and last several hours. There are bathroom breaks, but restrooms aren’t always immediately available. Some tours are a little rougher than others, so please give us a call at 719-275-6339. if you need more specific information before booking a tour. (Also, see the “Which tour should I choose” section above for more info.) We’ve taken children in car seats and seniors into their 90’s on all our jeep tours, so it’s possible to go if you’re pregnant or have medical issues, assuming you know your own abilities and limitations, and have the blessing of your doctor for off-roading activities. 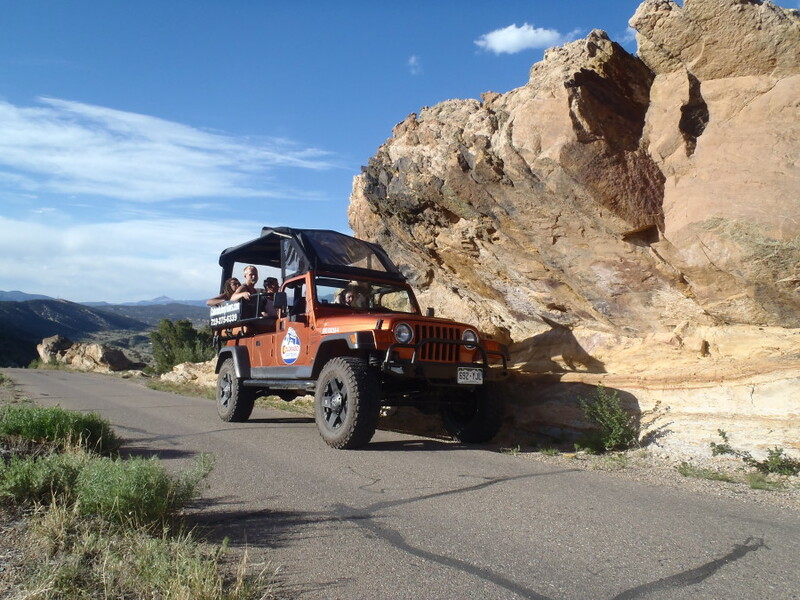 Please keep in mind that we are an off-road tour company, so we are at the mercy of Colorado’s ever-changing terrain. The trails can be great one day, then a thunderstorm comes along and the next day there may be more rocks and debris washed into the roads. There really is no way we can know what to expect from day to day. And, since most of the scenic vistas and viewpoints we take you to are on private property or rural public lands, they are rarely, if ever, maintained by road crews. Many folks enjoy the off-roading experience, but of course, there are some who don’t or shouldn’t be doing it. If you have a bad back, an at-risk pregnancy, neck problems, mobility issues or medical concerns, we recommend that you talk to your physician before deciding to go on our jeep tour. We will take you, but the decision is entirely yours. Are there restrooms on tour? YES! However, keep in mind that we are an off-road tour company and, in some locations, there may only be porta-potties or vault toilets in rural park areas, with no running water or wash facilities. If this may be an issue for you, we recommend bringing hand sanitizer and/or hand wipes. The local park service is generally pretty good about keeping the toilet paper stocked, but it never hurts to have some tissues in your purse/bag just in case. Because of the above, we recommend you use our office restrooms prior to tour departure. Is there pet boarding nearby? YES! If you’re on a full day combo tour package, or it doesn’t work out to take your dog on the jeep, there are kennels nearby that many of our customers use. Both take dogs and cats and require advance reservations/appointments and proof of current vaccines. Prices are around $20 to $25 per pet, per day. Pick up and drop off times vary by kennel/season. Contact the kennels directly for boarding info and reservations. 8 Mile Ranch (719) 275-2035 Located near Royal Gorge, 15 minutes west of our office. Country Kennels (719) 275-5681 Located 5 minutes east of our office in Canon City. Can I get around without a rental car? Private shuttle service. Requires at least 24 hours notice for reservations. Regular shuttle between Gunnison, Alamosa, Poncha Springs, Buena Vista, Canon City, Pueblo, and Denver. Rideshare service based in Colorado Springs. Provides taxi service throughout Canon City, Fremont County and nearby airports. Operates 24/7, providing luxury transportation services. Operates Monday through Friday from 9:00 AM until 4:00 PM. Offers affordable public transportation. Service is only available in Canon City. Provides door to door service with 24-hour prior notice. Many visitors are surprised to see plants like cactus, juniper, and sagebrush when they come to Colorado, but they are abundant in the Royal Gorge region. As we have a unique microclimate in the Canon City area, we are often 10 to 20 degrees warmer than many places along the front range, and it’s quite arid in this part of the state. We receive an average of only 13” of annual precipitation, most of which falls in the afternoons, during passing summer thundershowers. For historical info on our weather patterns, see the US Climate Data website. I need a hotel. Where should I stay? In spite of Canon City being a small town, we have a fair number of hotels, motels, campgrounds, and B&B’s to choose from. Most hotels are in Canon City, while the majority of the campgrounds are in the Royal Gorge region about 10 miles west of town, near the Royal Gorge Bridge. 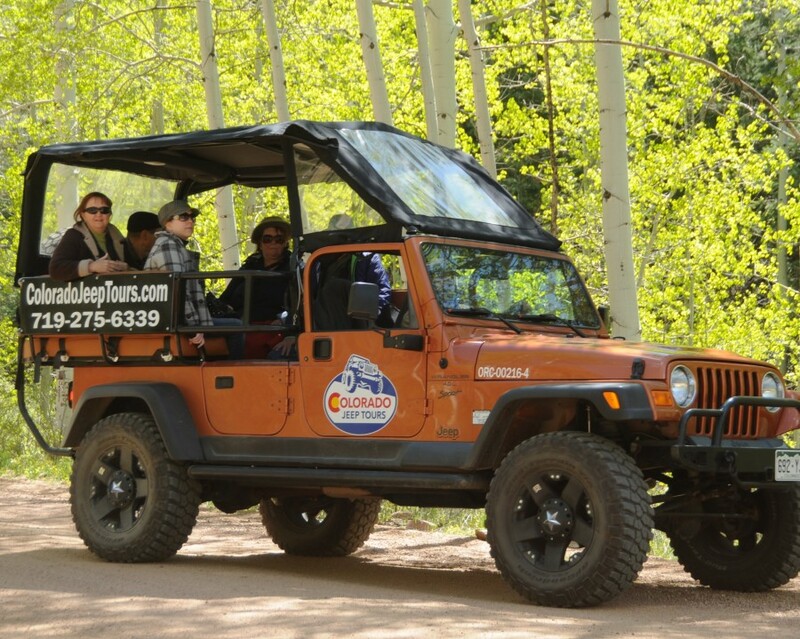 A few hotels generously offer discounts to Colorado Jeep Tours customers, if you tell them we referred you. See our Places to Stay page for details. If I'm going on the Jeep & Raft, where do I change? If you’re booked on our Jeep & Raft package, you’ll need to dress differently for each segment of your tour. No worries! 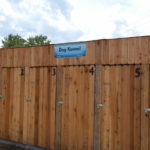 We have coin lockers and changing rooms for your convenience. We recommend leaving as much as possible locked in your car, and using the lockers for your wallet, car keys and other small items. For more details on the rafting portion of your Jeep & Raft tour, see the Raft Masters FAQs, or call at 719-275-6645. Our Jeep & Raft packages may be booked with us, or with Raft Masters, for the same price. Please also note that you will be required to sign a Raft Masters Liability Waiver, separate from the jeeping one, so make sure you leave time to handle that when checking in for your package tour. P.S. Want to check the current CFS (Cubic Feet per Second) water levels before your raft tour? We use the USGS (United States Geological Survey) website for the Arkansas River at Parkdale, Colorado. River levels are measured from April thru October. I'm doing the Jeep & Train. What are their policies? No outside food or beverages are allowed on board the Royal Gorge Route Railroad, with the exception of bottled water. No weapons of any kind are allowed on the premises or on the trains. No smoking, E-cigarettes, or vapors. Baby strollers, booster seats, and/or car seats may not be brought onboard. All bags are subject to search at the gate prior to boarding. For more information about the train portion of your Jeep & Train tour, please see the Railroad’s FAQs or call at 719-276-4000. Questions about disability access to the train? See the Out On Tour section above. Can my kids / dog go on the Jeep & Wine? YES! Well-behaved children and dogs are welcome at the Winery at the Holy Cross Abbey, but there are some restrictions for both. Minors under age 20 may participate in the “tasting” but they are given fruit juice instead of wine and charged $15 instead of $30. Dogs may join their family on the lawn picnic area, but may not be taken inside the tasting room. (Please be sure to pick up after your dog!) More specific questions about the tasting room’s child/pet policies? Email the Winery or call them at 719-276-5191.
Who can participate in the Jeep & Zip? Following are the requirements imposed by the Royal Gorge Bridge & Park in order for guests to ride the Cloudscraper Zip Line over the gorge. And, WOW, what a ride that is! Riders under the age of 16 must have a parent or legal guardian waiting at the landing site to ride. Riders under 18 must have a legal guardian sign the minor’s waiver. All Zip Line riders must sign the Royal Gorge Bridge waiver. Guests with physical conditions should not ride the Zip Line. 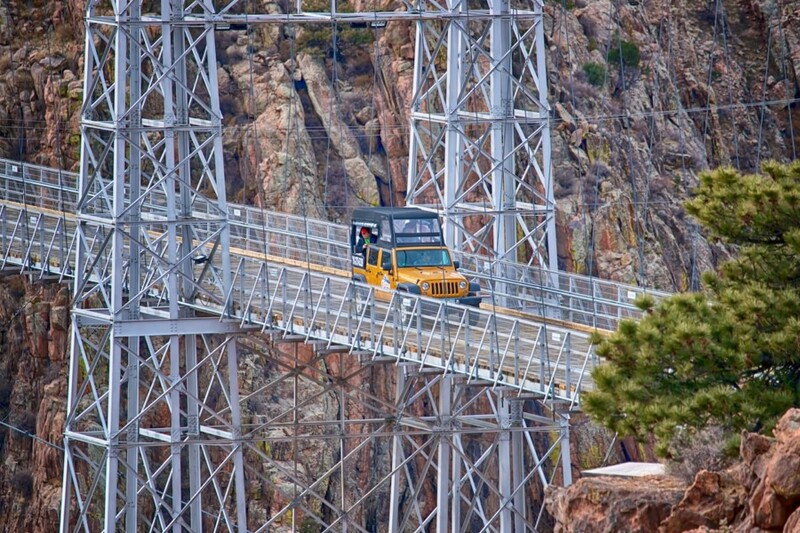 The Royal Gorge Bridge & Park requires all zip riders (or in the case of a minor, their legal guardian) to sign a Liability Waiver, separate from our jeeping Liability Waiver. To save time during check-in, we recommend that you download the Zip Line Waiver and bring the signed document with you. IMPORTANT NOTE: The Zip Line portion of the Jeep & Zip tour is done during the jeep tour. If there are some people in your party who want to zip, and others who don’t, no problem! Guests who want to zip are dropped off on the south side of the gorge, where they zip across to the Visitor Center. Guests who DON’T want to zip stay in the jeep and DRIVE over the bridge. Zip riders are then picked up on the north side of the gorge, and the jeep tour continues with all participants back in their original vehicle. HOW TO BOOK: If some are zipping, and some not, select either the Jeep & Zip or the Royal Gorge 1/2 Day – they are the same tour. Due to weather restrictions, the Jeep & Zip is ONLY AVAILABLE at 8:30am, so if you are booking the Royal Gorge 1/2 Day, be sure to select 8:30am. Once booked, send us an email with the dates and names of your parties, and we’ll do our best to combine you into the same jeep. Because the Cloudscraper is a seasonal ride, we recommend booking the Jeep & Zip first, to be sure the zip line is operating that day. Have questions or need our assistance booking? Give us a call at 719-275-6339. We’re happy to help! How do I receive Free Royal Gorge Bridge Tickets? 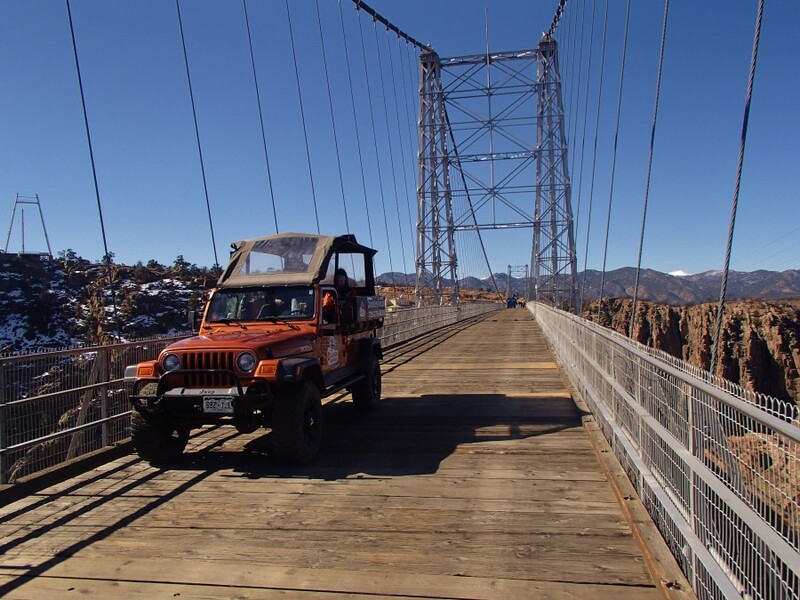 Effective 2019, customers who take a jeep tour to the Royal Gorge receive a FREE general admission ticket to the Royal Gorge Bridge & Park, compliments of Colorado Jeep Tours. To receive your free tickets you must purchase a regularly-priced Royal Gorge 1/2 or full day jeep tour or Royal Gorge Jeep combo package via our website ONLY. This offer is not valid if you book through a booking partner or a 3rd party booking service, such as TripAdvisor. Not valid with any other offer, discount, custom or group booking. Tickets have no cash value, may only be redeemed by the party who took the tour, and must be used within 24 hours of the tour. Contact us with any questions about this bonus.